Filipinos now is being connected more than ever before. With smart phones all around and wireless internet available almost everywhere, we are slowly becoming connected to the internet 24 / 7. Many of us have changed our buying and paying habits, transactions for payments such as basic utilities are now done online, as well as many purchases for food, clothes, etc. If you are tired of the long lines at the grocery or if you just can’t stand the long lines at your nearest department store, then look no further as there is a new website designed to help you with all your daily needs. Enter www.GOODS.PH, your one-stop shop for just about anything—from pasta, beverages, and even food supplements with just one click. Need some pampering? This online store offers a wide array of hair and body care products. Need something for the home? There are various home care items to choose from. Looking to the latest in computers and consumer electronics? 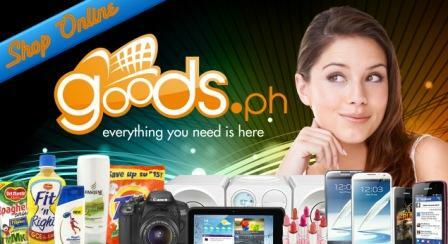 Goods.PH has the latest printers, monitors, desktops and laptops. They also have trendiest audio, video, cameras and gaming devices to choose from. That new Xbox, Tablet, and Playstation are now just a click away. For the ladies, Goods.PH has a wide range of shirts, blouses dresses, shorts, shirts, pants, jeans, rompers, bags and shoes to choose from. There is also various cosmetics that will surely catch your fancy. Need a particular shade of lipstick in a hurry? Or maybe run out of loose powder or eye shadow? Worry no more as whatever your price range is, Goods.PH surely can find you what you need at the most affordable prices. But wait, there’s more -- need a new appliance for your home? Have your fill of a wide selection of wide screen TVs, air conditioners, refrigerators, blenders, coffee makers, ovens and more. Goods.ph recently held a special media cocktail event last March 02, 2013 at The Events Place in Scout Rallos Quezon City where select members of the press were shown how easy it is to use the online store. Simply register to Goods.PH once, and click away. Transactions are done using bank transfer and Dragonpay.ph. After the purchase has been made, the item(s) will be delivered to the customer on the address he/ she provided on the registration page. All inquiries and online orders are done via the Goods.ph hotline 254-0197 with free shipping on all deliveries via LBC with purchases above P 1,500. For orders below P 1,500, there is a minimum charge. For any question about Goods.PH, you make send an email at support@goods.ph or call the Goods.ph hotline 254-0197.